An earthquake is a natural disaster that occurs miles underground and occurs either from volcanic activity or the shifting of tectonic plates. 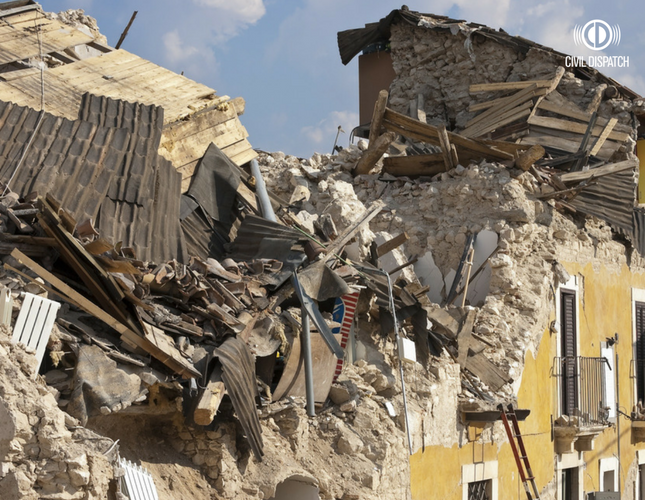 Earthquakes are extremely hard to predict so it’s even harder to prepare you and your family. Drop down onto your hands and knees so when the earthquake occurs it doesnt knock you over. Hold onto any sturdy covering so you can move with it until the shaking stops. Cover your hand and neck with your arms to protect your head from falling debris. If you find yourself in danger from falling objects, and you are able to, move safely under a desk or a table. If there is no sturdy shelter available, crawl away from windows, next to an interior wall. Stay away from glass windows, outside doors and walls and anything that could fall. Stay where you are until the shaking stops. Do not run outside and do not get in a doorway. This does not protect from falling or flying objects. If getting safely to the floor will be difficult, the actions you take before an earthquake to secure any items should be a priority. Identify any objects that could fall on you. The Earthquake Country Alliance advises getting as low to the ground as possible to the floor. People that are bound to wheelchairs or other objects should lock their wheels, bend over and remain seated until the shaking stops. Protect your head and neck with your arms or pillows. If you are in bed: stay there and cover your head and neck with a pillow. At night, hazards and debris are difficult to see and avoid; attempting to move in the dark can result in more injuries. If you are outdoors when the shaking starts, move away from buildings and streetlights. Once in the open, “Drop, cover and hold on.” Stay in this position until the shaking stops. It’s difficult to control a vehicle during an earthquake. If you happen to be in a moving vehicle when the shaking starts, stop as quickly and safely as possible and stay in the vehicle. Avoiding stopping near anything that could fall on your car such as trees, buildings or overpasses. Proceed cautiously once the earthquake has stopped; avoiding roads, bridges, or ramps that make have taken damage from the earthquake. When the shaking around you stops, look around. If the building you are in is damaged but there is a clear path to safety, leave the building and find an open space away from damages. If you happen to be trapped, do not move or kick up any dust. If you have a cell phone with you, use it to text or call. Tap on a pipe or wall or use a whistle if you have one, so that rescuers can find you easily. Once you are safe, monitor the local news and weather for additional emergency information and instructions. Check for injuries and provide assistance if you have training to do so. Assist carefully. If you live near the coast, get informed on tsunamis. If you are in an area that is prone to tsunamis, after the shaking stops, walk inland and to high ground immediately. Use extreme caution post disaster clean up. Do not remove heavy debris yourself and wear protective clothing at all times during the cleanup process. Be prepared to “Drop, Cover and Hold on” in the likely event that there are aftershocks. If you haven’t already, sign up to get SMS notifications from Civil Dispatch. Stay up to date on all of the severe weather in your area.